It's Facebook Fridays! for November 27, 2015, and we want to give your leadership abilities a big boost! The Lucky Mojo Curio Company is holding a random drawing to give away 10 Commanding Spiritual Supply prizes that are designed to give you the power to lead, govern, and direct the activities of others. 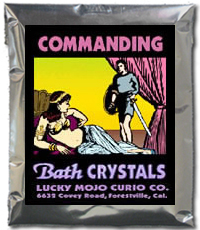 This week 7 lucky winners will get a bottle of hand-made Lucky Mojo Commanding Dressing Oil, and an additional 3 winners will get packets of Lucky Mojo Commanding Bath Crystals. First thing tomorrow morning, we will select TEN winners at random, announce their names here, and ask them to message this Facebook Page with their mailing addresses, so we can send them their FREE Commanding products. We have a winner! In fact, we have 10 lucky winners! Our Facebook Fridays! winners for November 27, 2015 are: AmyBeth Gilstrap, Dane Olson, Aphrodyti McGhee, Mark A Miller, Adriana Zúñiga, Angelyn Smith, Sherry Lynn Smith, Lauren Hunt, Rachel Guerra, Naomi Kashinsky.